A partnership between ecology of awakening and Pachamama alliance! We live in a time where modern science is helping us rediscover what our ancestors knew: that the same creative force which brought forth the stars and Redwoods is also coursing through, and informing, each one of us. If we are to express our fullest potential and create resilient, thriving communities for future generations, it is essential that we free ourselves from the predominant story of separation, and open to what our ancestors knew: that we are an inherent part of the larger unfolding that brought us forth. The Earth Wisdom Immersion draws from contemporary and ancient Earth-based wisdom traditions to support an embodied experience of what it is to live into our true inheritance, intimately connected to each other and the whole Earth community. Kerry Brady, founder and director of Ecology of Awakening, and David Tucker, director of Pachamama Journeys, weave together their years of experience in both South and North America to support direct engagement with that which seeks to awaken and guide us. By coming together in community and engaging in mutually reflective encounters with the land and with each other, we will create a vibrant ecology that invites us to listen and respond to the way life speaks to each of us. In this mysterious and fertile ground, we gain access and insight into how our unique expression and gifts fit into the deep needs of our time. 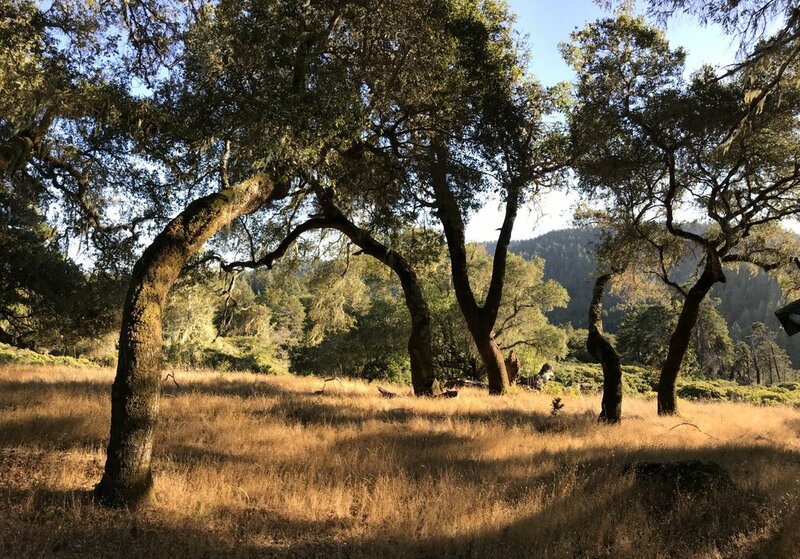 For five days we live in the rolling coastal hills of Occidental, CA in a spectacular endemic ecosystem marked by abundant wildlife, active waterfalls, coastal prairie meadows, old-growth fir and oak woodlands that dwell in serpentine soils. We will dance with council practice, solo time on the land, nature-based processes, listening meditation, inner and outer tracking, dream-work, somatic resiliency work, ceremony and other time-proven practices and processes that usher us towards dissolving our borders and discovering our deepest identity and belonging. Joining us is master biologist and naturalist, Brock Dolman, who will support us in skillfully bridging the macro and micro realms, deepening our connection with and understanding of nature’s brilliance. Our fabulous chef, Nora, will nourish us with local, organic meals and her beaming presence! The Earth Wisdom Immersion is for those awakening from the predominant cultural story of separation who are, in their unique way, working towards a resilient, thriving Earth community for future generations. The program is designed for those who have the capacity to move fluidly between inner/personal and outer/collective experience rather than for those who may, at this moment, be primarily focused on their own personal/trauma healing. While it is not designed primarily to promote personal healing or resolve issues, healing, personal clarity and deep connection can be natural outcomes of the process. To help us ensure that the program aligns with you, and our, deepest intentions, we’ve developed an APPLICATION (button below). We aim to balance the actual cost of running programs with our commitment to make our offerings as accessible as possible to those who are called. Please know that our pricing greatly underestimates the number of hours that our team spends preparing, organizing and facilitating. Additionally, we keep our programs to a maximum of 16 in order to facilitate optimum engagement between guides, participants and what emerges while living in community on the land. Tuition includes all program instruction and materials, guide support, camping fees, as well as local, organic breakfasts and dinners prepared by our fabulous chef, Nora, who puts her whole heart into each meal. Participants are responsible for their own lunches and snacks, to allow space for personal reflection and time on the land in tune with one’s own rhythm. There is a full outdoor kitchen available to aid with food preparation. Tuition does not include transportation costs to or from Occidental. $1,595: This tier covers our basic costs and makes this opportunity available to others. $1,295: This tier covers our basic costs. $ 995: This tier is set below our actual per person cost and is designed to create more access. We are committed to diversity and equity and aim to price our program to support inclusivity and access. We offer scholarship support to those who feel called to this journey who are currently limited in their finances. If you are called to the program yet unable to pay the above fees, we encourage you to apply for scholarship support as we want to work with you.